My thirteenth ground of 2016 was on Tuesday 23rd August at Krooner Park in Camberley, Surrey. 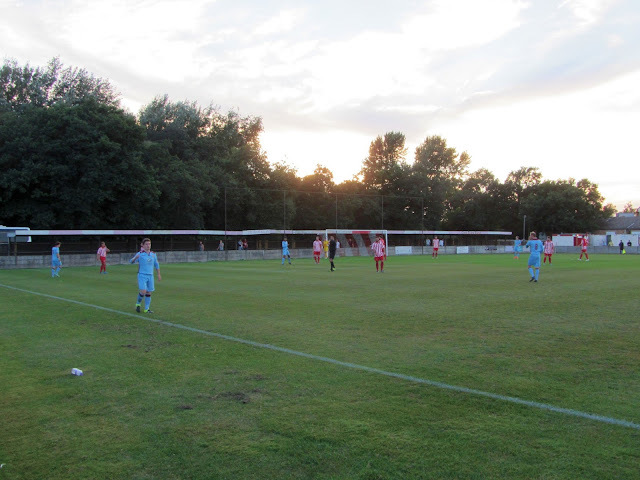 The match was Camberley Town vs. Bishop's Cleeve in an F.A. Cup Preliminary Round Replay. Krooner Park is within an industrial estate with buildings from this bordering the ground to the north and south. There is housing behind the eastern end with the western end backing onto the park itself. It is half a mile north of the M3 motorway and one mile south-west of the town centre where Camberley railway station is located. The venue has been the home of Camberley Town since 1923. The north side of Krooner Park holds an all-seater stand with room for 195 spectators including one section given over to club officials. This stand is attached to the club building which has a bar and dressing rooms within and a snack bar facing outwards. The remainder of the north side is taken up with uncovered hard standing. Hard standing is what is in place on the south side of the venue as well with this concrete strip having a fairly wide grass section behind it. The two dugouts are positioned on this side of the ground. The area behind the eastern goal is also uncovered though is much narrower. There is netting behind the goal itself in reference to the houses located adjacent to Krooner Park. The western end contains the venue's second stand which is known as the Chris Evans Stand. This takes up close to the entirety of the west side with a single level of raised concrete and cover for spectators in the form of a wooden roof. This was an F.A. Cup Preliminary Qualifying Round Replay between Combined Counties League Premier Division side Camberley Town and Southern League Division One South & West side Bishop's Cleeve. The lower league side had recorded a 1-1 away draw three days prior giving them another chance at home. In an even first period it was Bishop's Cleeve looking possibly the better side in midfield but Camberley looked the more dangerous in the attacking third. In the 32nd minute this was proven when the hosts took the lead - a corner found Callum Nimmo in acres of space and he was able to produce a towering header which went over everyone into the top corner of the net. In the 53rd minute the hosts came close to a second when Jamie Hoppitt beat a defender down the right and slid the ball past the advancing keeper only to see a covering defender clear off the line. Camberley were now in the ascendancy - in the 63rd minute a goalline was required to tip Marcus Cousins' header over and the home side saw efforts cleared off the line in the 65th and 69th minutes of the game. Bishop's Cleeve goalie Marc Wright kept the deficit down to one in the 71st minute with a great double save to keep out two close range shots. Finally the pressure paid off with 15 minutes to go when Camberley were awarded a free-kick from 25 yards out. Dan Jewell stepped up and drilled the set piece into the bottom corner to put his side 2-0 up. The hard work of the home side looked under threat in the closing stages when they were reduced to ten men after Dean Greenwood saw red for kicking out at Bishop's Cleeve subsitite Matt Magee. This invited pressure onto the Combined Counties League side with a couple of late box scrambles but they were able to ride pressure to secure a deserved win to take them through to the 1st Qualifying Round.